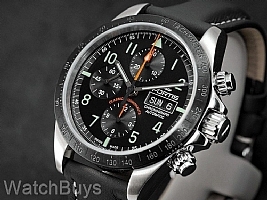 The Fortis Classic Cosmonauts Chronograph Ceramic PM features a 42 mm case with complete chronograph functions. The dial is matte black (hence the PM in the name of this watch), with the hour and minutes hands trimmed in silver with applied green SuperLuminova and a silver seconds hand. This watch is fitted with a Fortis black calf leather strap with white stitching and tang buckle. Verified Owner Comments: Love the watch. The customer service was first class all the way. Enjoying the watch totally . Would highly recommend to others !! Verified Owner Comments: Received this watch two days after purchasing it. This was my first time buying from watchbuys and I could not have had a better experience. The watch is beautiful and the detailing is top notch. I highly recommend this watch. Verified Owner Comments: Folks from watchbuys is awesome , they are fast helpful and understand your need, chatting with them give me a feeling that they just sat there and waiting for my questions. Watch arrive in 2 days as promised and it on my wrist since then, love the strap fit right on my 6.750 wrist. Verified Owner Comments: This watch is so nicely made and exudes quality. it is a bargain for the price. The dial is gorgeous, especially the mint green lume and the orange chrono second hand. 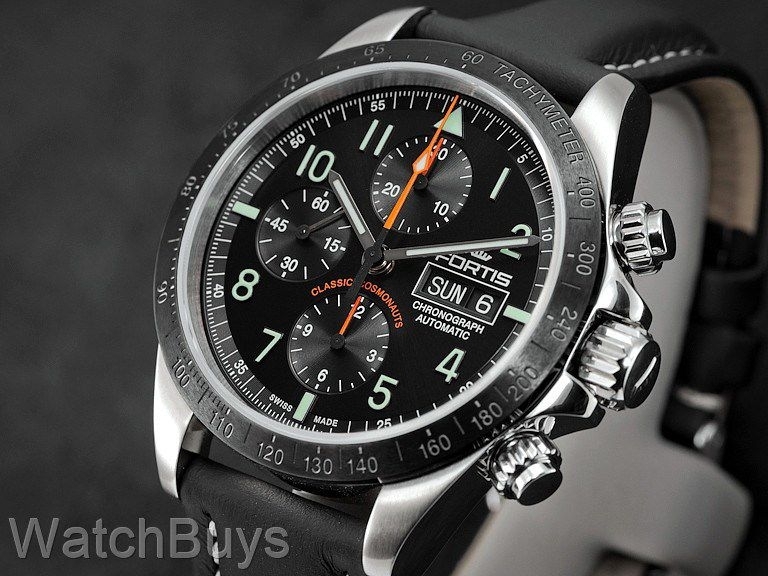 The ceramic bezel is sporty but the tachymeter scale is very subtle making the watch a little more dressy. I love the easy legibility and the day-date. The watch is not slim (haven't seen a Valjoux 7750 that is) but wears well. I have some 3-handed divers that are thicker and chunkier. The accuracy has been excellent. My only complaints are 1) the running seconds hand at 9:00 can be hard to read. The metal hand sometimes catches the light but sometimes it disappears into the sub-dial, and 2) I don't love the collars on the chrono pushers. They are a classic look (i.e. Daytona) for sure, but just an extra thing to fiddle with when you want to start timing something. Both of those are minor complaints on what is otherwise a great watch that I've been wearing every day with joy.